Air France 447 disappeared from radar on June 1, 2009 but then, due to the messages from the onboard communication equipment indicating a total electrical failure, its disappearance from radar was assumed to be due to the plane going under the waves. Malaysia 370 likewise disappeared from commercial radar on March 8, 2014, but the plane did not immediately go under the waves. The plane was later picked up on military radar, off course and heading west. It was, thus, a radar failure when the plane first disappeared. Then an LAX ground stop was forced on April 30, 2014 when the radar system was so discombobulated that the computer system choked with error messages. And now, the latest incident, 50 planes temporarily disappeared from radar over Austria, Germany, the Czech Republic and Slovakia on June 5 and June 10, 2014. All radar outages over these days occurred in the afternoons, from 2:00 pm to 9:30 pm. Note this time. 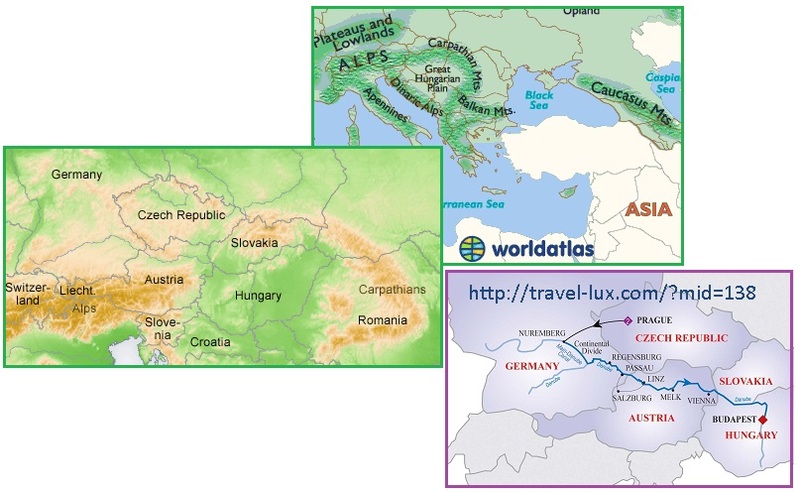 Note also that all affected countries lie along the Danube River, which is in the Euro stretch zone and as a river basin is the weakest crustal point between mountain ranges. This land was pulling apart, thus the electronic screech created arcing with the charged tail of Planet X. An air-safety investigation has been launched after 13 planes flying over Europe disappeared from radar screens in two "unprecedented" blackouts. The aircraft went missing from screens across the region in early June, leaving air traffic controllers with no information about their position, direction and height – instead relying on voice communication alone. Air traffic control centres in Austria, southern Germany, the Czech Republic and Slovakia all reported the same problem with each period of interference lasting around 25 minutes but varying from flight to flight. In the June 5 incident, 10 aircraft disappeared from radar screens while on June 10, a further three went missing. So far experts are at a loss to explain what caused the aircraft to disappear. After radar air traffic control systems were paralyzed in parts of Central Europe by an unknown jammer last Thursday [June 5], on Tuesday [June 10] planes again disappeared from the screens of air traffic controllers. During the first incident, a NATO exercise had been suspected to be the reason, but at the time of the second incident there had been no NATO exercise. In the first blackout in the previous week, from 14 o’clock on planes disappeared from the radar screens of air traffic control centers in Vienna, Bratislava, Karlsruhe and Prague, even though the aircraft were in the air. On Tuesday a second blackout followed. Between 13:30 and 15 o’clock suddenly planes disappeared from the screens. This time the air traffic control in Vienna, Munich, Karlsruhe and Prague were affected. According to the information it lasted in Austria till 17 o'clock and in the neighboring countries till 19.30 o'clock. Dozens of aircraft briefly vanished from air-traffic control radars in Austria, Germany, the Czech Republic and Slovakia over the last two weeks in incidents that Slovak authorities blamed on military electronic warfare exercises. 10 planes passing through Austrian airspace were affected in the first incident and three in the second. 50 aircraft in total were affected across Europe. NATO was blamed at first, as they were conducting a radar jamming exercise in nearby Hungary, but it was quickly established that there was no correlation in date or location. These NATO exercises are common, and had never resulted in interference with commercial aircraft. Thus, the word “unprecedented” in the headlines. Per the Zetas, these episodes of radar malfunction were the result of electro-magnetic interference from the charged tail of Planet X. At first a NATO electronic warfare exercise in Hungary was suspected as the cause of interference as it coincided. The exercise, apparently, used devices designed to interfere with enemy radar and there were suspicions it may have affected civilian flights. But Hungary's defence ministry denied any NATO involvement, saying the technology used was weak and had a range of only 4,000 metres – a height well below the altitude of the aircraft. Deepening the mystery is the fact that the second incident occurred after the exercises had finished. The military alliance, in response to a request for comment, said it did carry out some training that involved "localised and low-power jamming" in the skies over Hungary during the June 2-6 period and that it was currently conducting similar training in southern Italy from June 9-20. However, it said no jamming was conducted on June 5. ZetaTalk Insight 6/21/2014: Though related in time for the first outage, the fact that commercial planes in Europe disappeared from radar was not caused by a NATO exercise in Hungary to block military radar. We have predicted increasing electro-magnetic incited outages, affecting airplanes as well as mankind’s grid, as the magnetic hosing from the N Pole of Planet X increases. There will almost always be some other suspected cause that the establishment will point to, during such incidences. MH 370 was followed days later by similar problems with their MH 066, but the similarity in location and electrical failure was ignored in the press. The truth is too frightening to the establishment. They cannot predict or control these EMP incidences. Had the NATO exercises not been ongoing at the time of the first incident, these outages would not be getting this press attention. Military exercises to block military radar are regularly scheduled and conducted, and cause no interference with commercial radar, as is being admitted. 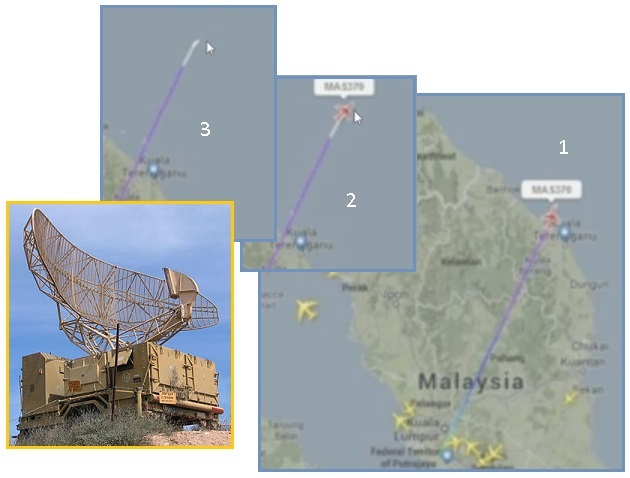 Of course this type of radar interference happened with MH 370, so the crippled plane appeared to simply disappear from radar for a time. These 13 European planes escaped having their electronics crippled, as the EMP wash was directed at radar installations on the ground rather than the planes. Radar and the particle flows in an electro-magnetic range have a history. In early 2010 radar circles showed up in Australia. Per the Zetas, the radar was picking up coagulated particle clumps that were related to the Earth’s magnetic field, and affecting Australia because the magnetic S Pole of Earth lay nearby. ZetaTalk Explanation 1/25/2010: The white areas that look like spokes on a wheel are the lingering results of changes that the radar emissions caused in the atmosphere, a type of coagulation of particles that clump together and then have a dearth in between the spokes. Australia lies near the Earth's magnetic S Pole, which is south of this continent but nevertheless nearby. At times the Earth today is dealing with a failure or lack of magnetic particles returning to the S Pole, and this sets into play all manner of other dramas in the atmosphere. MH 370 disappeared from radar on March 8, 2014 at 1:21 am. A similar episode, with MH 066, occurred along the same path from Malaysia to Viet Nam two weeks later on March 24, 2014 at 2:30 am, forcing an emergency landing in Hong Kong. Where MH 066 did not disappear from radar, it had electrical problems resulting in engine and generator failure, unexplained to this day. Same location, same time of day, same type of problems. Note the time of day. ZetaTalk Explanation 3/15/2014: As man is aware, electrons and magnetons like to flow together. This is the reason an electrical field can be generated by rapid movement around a magnet. By blasting the Earth from the side, Planet X is creating hot spots where magnetons are crowded, and this attracts electrons to those hot spots. When rock is under pressure, there is also an electric screech that alarms animals in the area and creates static on nearby radios, as water within the rock can conduct electricity more readily when the rock is squeezed. What happens then, when a temporary magnetic hot spot forms over rock under pressure? The crowded electro-magnetic field will ground, and the electronics in the hapless plane in its path silenced. LAX had a ground stop on April 30, 2014 because the FAA computer system was flooding with error messages. The official excuse was that a high flying airplane kept registering at different altitudes, forcing the program to recompute flight paths, but it was the radar system that was passing along erroneous information, the true cause of the crisis. This occurred during the afternoon on April 30. Take note of the time. Per the Zetas, the radar malfunction was due to rock stress from the N American bow. This created arching from the ground to the charged tail of Planet X. What is the commonality between rock screech in the Sunda Plate between Malaysia and Viet Nam creating electrical and radar problems in MH370 at 1:21 am and MH 066 at 2:30 am, and rock screech along the San Andreas at the heart of the N American bow stress creating radar malfunction in the afternoon, and rock stress along the Danube River in the heart of the European stretch zone creating radar outages from 2:00 pm to early evening? Why were the Malaysian planes repeatedly occurring at this time of day, and why were the European planes repeatedly being affected at the same time of day? The answer clearly lies in the Earth wobble. The strong polar push, when the N Pole of Earth is pushed away as it comes up over the horizon to face Planet X, occurs when the Sun is high over the Pacific. This accounts for the stress on the Sunda Plate predawn at 1:21 am. This also accounts for the stress on the N American bow in the afternoon in California. But what about Europe in the afternoons? The Figure 8 of the wobble is such that the globe bounces back from the polar push when the Sun is high over the Americas. It is, at that time, afternoon to evening for Europe. The pumping of the polar push, and the bounce back, are accentuating lately, becoming stronger, and the stress on the Earth plates follows. 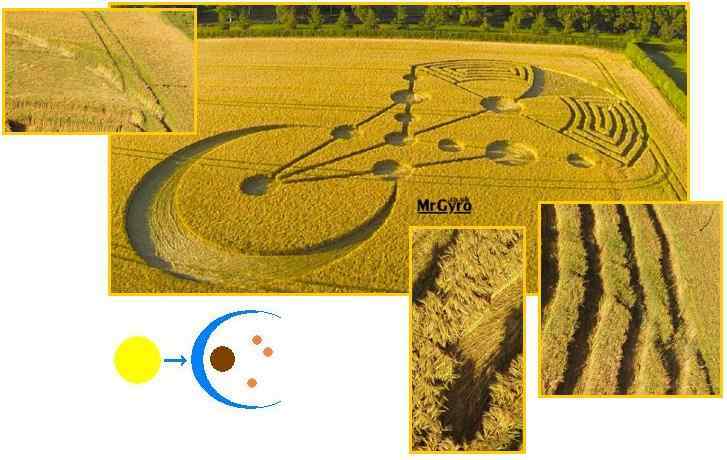 In the Summer of 2003 several crop circle designs appeared near Horicon Marsh in Wisconsin, all holding the ZetaTalk Triangle within the design. 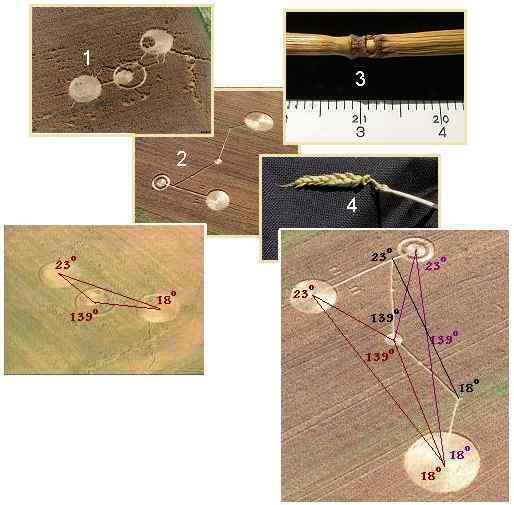 This was featured in January, 2014 in a Huffington Post article, as noted in Issue 381 of this newsletter, when the Salinas crop circle in California was in the news. Per the Zetas, in 2003, the legitimate circle makers were giving a nod to ZetaTalk validity on predicting the inbound path of Planet X, which had arrived in the inner solar system just months before. ZetaTalk Insight 1/11/2014: Why was the significant design laid in Wisconsin in 2003 near Nancy’s home featured so obviously on HuffPost? This is clearly related to the pending announcement admitting the near presence of Planet X, aka Nibiru. As we have mentioned repeatedly, there are two cover-ups expected to drop during the announcement – the cover-up over the pending passage of Nibiru, and the cover-up over the reality of the alien presence. In that NASA found it necessary to mention Nancy’s name in the past, warning the public not to listen to her, and did so repeatedly in 2009 and through to their Fall 2012 Hangout on the Mayan Calendar issues, she is expected to get media attention after the announcement proving that she had been correct all along. But it is more than this that will rocket Nancy into the spotlight. ZetaTalk correctly predicted the path Nibiru would take into the solar system in the years prior to 2003, and much of this will be included in the announcement. Where did this astonishing information come from, if not from we, the Zetas, as Nancy claims? Thus Jeffrey Wilson, a long standing and well respected expert on circle origins, is quoted in the HuffPost article not only declaring the Chualar formation a fraud, but declaring in the slides that the 2003 Wisconsin formation was legitimate. Now another nod from the circle makers has occurred, this time in June, 2014 in the Badbury Rings design in the UK. Per the Zetas, this design speaks of the Earth wobble, the Earth caught “in the cup” as ZetaTalk has described the planets trapped before Planet X by the eddy flow of particles coming round from behind Planet X. What is remarkable is that the pincers of the cup in the Badbury design are identical to the pincers drawn by myself, Nancy Lieder, in 2005! Once again the circle makers are pointing to ZetaTalk, giving a nod to its accuracy track record. ZetaTalk Interpretation 6/21/2014: The Banbury design is indeed a legitimate design subsequently altered by hoaxers who added maze wings. The focus of Banbury is the Earth wobble, and the forces that drive it. We have described the pincher hold that Planet X has on the Earth as catching the Earth “in the cup”, so it cannot escape in either direction due to the eddy flow of particles coming round from behind Planet X. In fact, this circle design looks remarkably like Nancy’s drawing of the cup some years ago. The Earth wobble has many facets, depending upon where Planet X is in its dither and depending upon whether the N Pole of Earth is leaning away from Planet X or toward it, during an opposition lean. Ultimately, during the Last Weeks, the wobble patterns fixate on a stopped rotation, the Earth frozen, with a subsequent release during the passage. The hum, a vibrating noise caused when rock is under unrelenting tension, has been featured in this newsletter for Green Bay and Detroit, where the Seaway is tearing open and for the UK where mating frogs were blamed. Per a database of hum reports, “The classic description of the Hum is that of a truck engine idling outside one’s home. Some describe it as a low throbbing drone or deep bass note.” The N American continent is under a continuous bowing stress; Europe is continuously being stretched; and eastern Australia is constantly lifting - as this database shows. Per the Zetas, this continuous vibration in certain parts of the globe is due to the stress on the plates caused by Planet X. Planet X causes the Earth wobble, and this is responsible for the 7 of 10 plate movements in process. 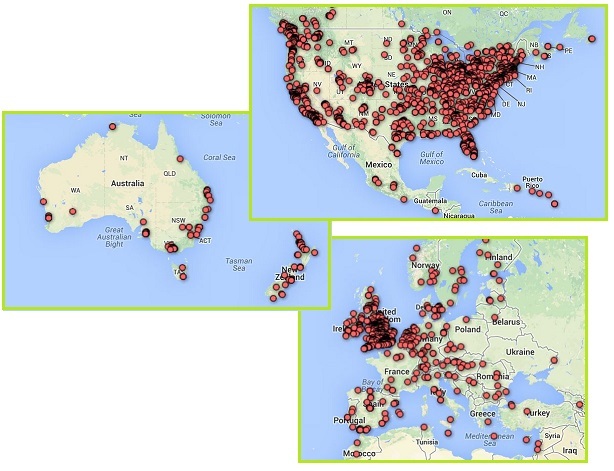 "The Hum" refers to a mysterious sound heard in places around the world by a small fraction of a local population. It's characterized by a persistent and invasive low-frequency rumbling or droning noise often accompanied by vibrations. While reports of "unidentified humming sounds" pop up in scientific literature dating back to the 1830s, modern manifestations of the contemporary hum have been widely reported by national media in the United Kingdom, the United States and Australia since the early 1970s. The Hum is often prefixed with the region where the problem centers, like the "Windsor Hum" in Ontario, Canada, the "Taos Hum" in New Mexico, or the "Auckland Hum" for Auckland, New Zealand. Somewhere between 2 and 10% of people can hear the Hum, and inside isolation is no escape. Most sufferers find the noise to be more disturbing indoors and at night. Much to their dismay, the source of the mysterious humming is virtually untraceable. ZetaTalk Explanation 8/31/2013: What is termed the “hum” is actually a vibration that is felt more than heard. The Earth wobble, which is caused by tugging or pushing by Planet X on magnetic points on the globe’s crust, creates the 7 of 10 plate movements, and of course these movements are preceded by tension and torquing in the rock. The rock can be compressed or stretched or twisted. Any of these maneuvers creates vibrations because rock layers are dragged across each other, snag, and when the snags release there is a jerk forward and a bounce back – in other words, a vibration. Steady state stretch zones will get these vibrations continuously. Kojima of the Pole Shift ning has discovered that where seismograph sites such as LISS show earthquakes in the classic manner, the details are much more revealing. Many parts of the globe are showing continuous motion in the Earth plates. 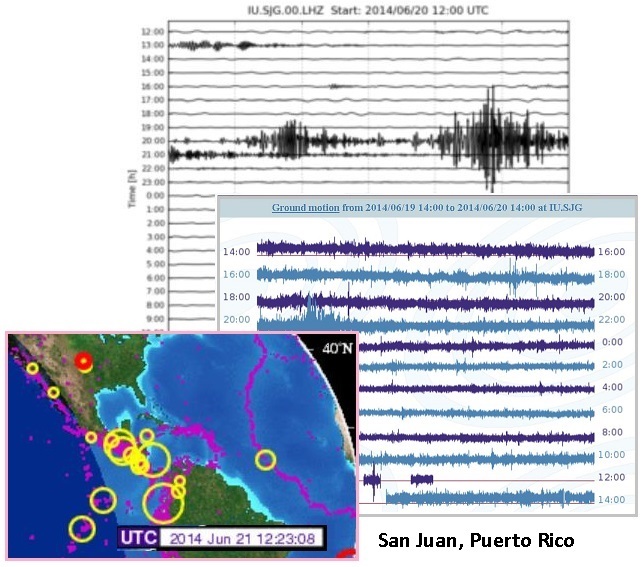 San Juan Puerto Rico, for example, had only small earthquakes nearby on June 19-20, which show up on LISS, but the REV detail shows continuous movement. No wonder things are humming!